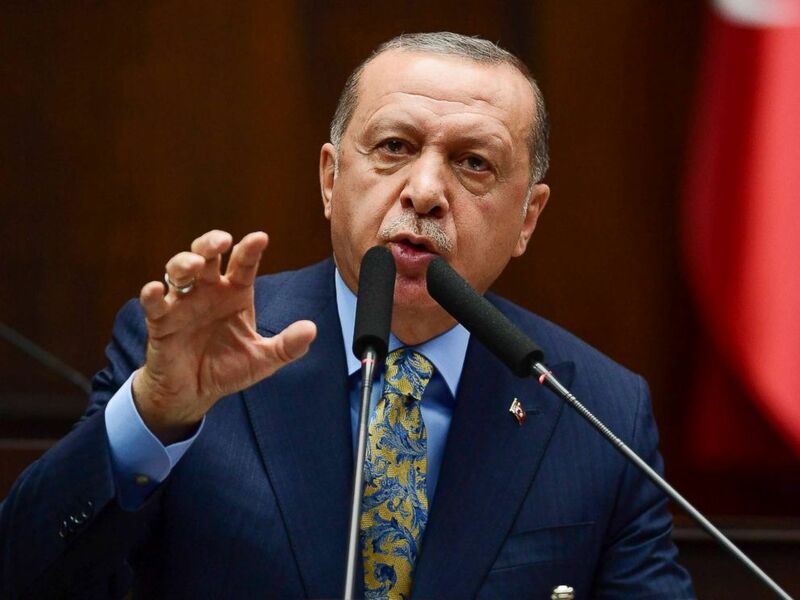 Turkish President Recep Tayyip Erdogan said on Tuesday that the killing of Saudi journalist Jamal Khashoggi was "savagely planned" by the Saudis. Erdogan in a speech to Turkey's Parliament laid out a timeline of events from the moment a team of Saudis arrived in Istanbul for what he said was the intentional killing of Khashoggi, a Washington Post columnist critical of the Saudi government who disappeared after going into the Saudi consulate in Istanbul on Oct. 2. "The information and evidence we have gathered until now shows that Khashoggi was the victim of a murder which was savagely planned,” Erdogan said. Khashoggi, who has been living in the U.S., went missing after visiting the consulate for documents he needed to marry his fiancé, Hatice Cengiz. His disappearance set off an international uproar. Saudi officials at first denied involvement, saying Khashoggi had left the consulate through the back door. That explanation has since evolved to Saudi officials' saying that Khashoggi was killed unintentionally in the consulate when he was put in a chokehold. Erdogan said Tuesday that the 18 individuals whom Saudi officials identified late last week as having being involved in Khashoggi's death are the same whom a Turkish investigation has found to be responsible, Erdogan said. The Turkish president didn't mention the audio recording that Turkish media said had recorded Khashoggi's murder. He also didn't present any physical evidence from the investigation. Erdogan said Saudi Arabia was obligated to reveal the identity of everyone involved and called for the prosecution of those responsible to happen in Turkey. President Recep Tayyip Erdogan speaks about the murder of Saudi journalist Jamal Khashoggi during his weekly parliamentary address, Oct. 23, 2018, in Ankara, Turkey. Erdogan called on Saudi Arabia’s leaders, including the king, to accede to a Turkish trial for the suspects. "My proposal to the Saudis is that the 15 plus three -- 18 -- people who were arrested should be tried on our soil, in Istanbul." 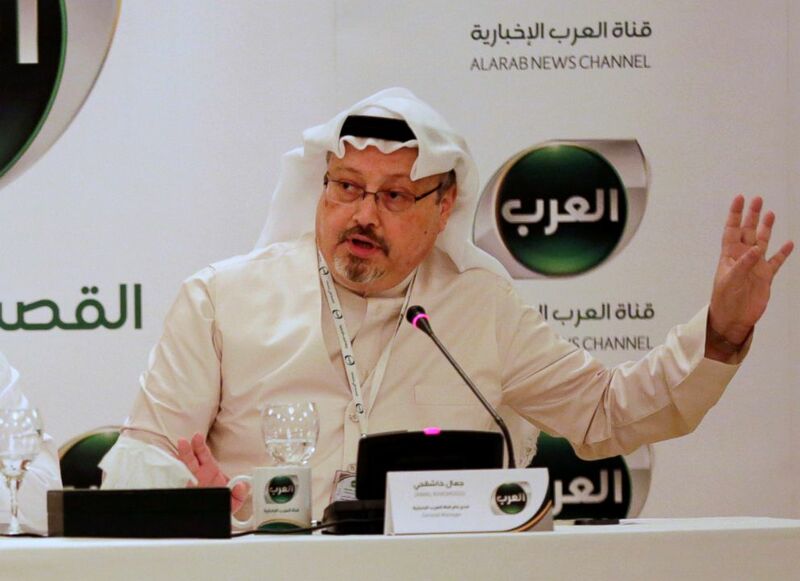 Saudi officials said Friday, more than two weeks after Khashoggi’s disappearance, that the journalist died in a fight at the consulate. Over the weekend, the Saudis' explanation continued to evolve with a Saudi official's telling ABC News that Khashoggi died when he was "placed in a chokehold position" to stop him from leaving the consulate and calling for help. On Monday, CNN received surveillance videos from a senior Turkish official that appeared to show a member of the 15-person Saudi squad dressed in Khashoggi's clothes the same day the journalist went missing. Then, a Saudi official told ABC News that the team of men who met Khashoggi at the consulate was acting on orders from the Saudi intelligence agency, GIP. According to the official, the mission involved taking Khashoggi to a safe house for 48 hours in order to pressure him to return to Saudi Arabia. President Donald Trump on Monday told reporters he wasn't satisfied with the Saudis' response to Khashoggi's death, adding, "I'm not satisfied with what I've heard." Trump, however, continued to defend U.S.-Saudi economic relations. "I don't want to lose all of that investment that's being made in our country," the president added. CIA Director Gina Haspel headed to Turkey on Monday to address the investigation of Khashoggi's death, two sources confirmed to ABC News. Treasury Secretary Steve Mnuchin met with Saudi Crown Prince Mohammed bin Salman in Riyadh on Monday to discuss American-Saudi strategic partnerships, according to the Saudi Press Agency. Saudi Arabia has said that the crown prince was not involved in the mission against Khashoggi. Erdogan in his address to Parliament on Tuesday criticized the conflicting explanations of Khashoggi's killing and asked why Khashoggi’s body has still not been recovered.